A Vision of the Possible by Daniel Sinclair – This is a good book for a team to read before going on the field as it gives a great overall roadmap for cross-cultural church planting. It’s very practical, dealing with such issues as team formation and leadership, preparation, entrance and residency, language learning, spreading the gospel, discipleship, raising leaders, and church multiplication. Bonding and the Missionary Task by Thomas and Elizabeth Brewster – This one should also be read before arriving on the field. If there is any book I want a new missionary joining us to read, it’s this one. This short booklet gets straight to the heart of one of the biggest mistakes missionaries make – not bonding with the local people and culture – and gives practical direction on how to bond effectively. Language Learning IS Communication IS Ministry by Thomas and Elizabeth Brewster – The companion to the Bonding booklet, this one presents language learning as the first important ministry the missionary should have in the host country. We don’t learn language so that we can minister; rather, our language learning communicates powerfully to the locals and is itself an important ministry. 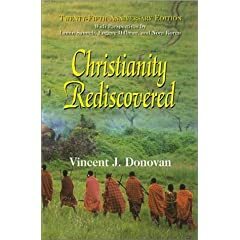 Christianity Rediscovered by Vincent Donovan – This excellent books deals with what the job of a cross-cultural church planter is and isn’t. Through Donovan’s personal experiences as a Catholic missionary to the Masai of Tanzania, he casts a wonderful vision for mission work. The vision is that missionaries should carry out the simple task of delivering the gospel message, trust the Holy Spirit to reveal the gospel’s application, make disciples, and then do one of the most important things they’ll ever do – leave. Missionary Methods: St. Paul’s or Ours? by Roland Allen (available free online from Google books) – This book, overlooked for decades, has gained popularity in recent times. Vincent Donovan was heavily influenced by it, so it’s a great read after Christianity Rediscovered. Christianity Rediscovered casts the vision, and Allen’s work lays out the framework of thinking behind that vision – getting rid of extra baggage and simplifying our work to the type of ministry that allowed Paul to establish churches all over Asia Minor in just a few years. Organic Church by Neil Cole – Organic Church gets at the heart of what the Church is in its simplest form and how God intended it to reproduce organically. I like our new missionaries to read it to give them a clear and simple vision of Church, because complexity kills. Church Planting Movements by David Garrison (either the full-length book or the concise booklet available free from the IMB) – Based on research of movements on several continents, Garrison’s work lays out characteristics common to every movement of rapidly multiplying churches as well as discussing factors that hinder them. It hits on important topics such as the importance of prayer, broad sowing of the Word, lay leadership, and avoiding restrictive, authoritarian structures. Two Ears of Corn: A Guide to People-Centered Agricultural Improvement by Roland Bunch – I recommend this book not because I think missionaries have to do agricultural development, but because its principles carry over very well to church planting work. Two Ears of Corn deals with important issues like dependency, reproducibility, and simplicity. What do you think? If you were making your own list, is there anything you would add or subtract? Those of you helping new missionaries entering the field, what are you recommending to them? This entry was posted in Church Planting and Discipleship and tagged a vision of the possible, bonding and the missionary task, christianity rediscovered, church planting movements, cross-cultural church planter, daniel sinclair, david garrison, language learning is communication is ministry, masai, missionaries, missionary methods: st. Paul's or ours, neil cole, organic church, roland allen, roland bunch, thomas and elizabeth brewster, two ears of corn, vincent donovan on December 23, 2009 by Chris. Since I intend to post a few things from Vincent Donovan’s book Christianity Rediscovered, I figured I should go ahead and give an official plug for the book. …Suppose you were a missionary and you realized how questionable the whole system was. And yet suppose you believed in Christianity, believed that Christianity had something to say to the world that is pagan–for that is what it is, more than three-quarters pagan. What then? What would you do? Maybe you would do as we did, begin all over again from the beginning. That means precisely what it says, starting from the beginning, with, perhaps, only one conviction to guide you, a belief that Christianity is of value to the world around it. That is presumption enough. Beyond that, no preconceived ideas either as to what Christianity is or what paganism is. What it means is a willingness to search honestly for that Christianity and to be open to those pagan cultures; to bring Christianity and paganism together and see what happens, if anything happens; to see what emerges if anything can emerge, without knowing what the end result will be. The actual carrying out of such a quest has been an adventure, a journey of the mind and of the soul, a disconcerting, disturbing, shattering, humbling journey. I would like to invite the reader to go on that journey with me. But before commencing it, one would want to have the same open-mindedness toward it, with no convictions beyond the one that Christianity is something of value; no preconceived notions about God, salvation, Christ, the meaning of being a Christian, the church, the sacraments, the liturgy, the priesthood, or anything else traditionally associated with Christianity. Without such an openness of mind on the part of the reader, this book would make no sense. I highly recommend this book to those who are making disciples and planting churches in a cross-cultural context. Most of you immediately think of foreign missionaries when I say that, and they make up a good part of who I am writing this to. But I think in a country like the United States, the church will do well to realize (and is realizing more and more) that a good percentage of the ministry we do within our own cities is cross-cultural. I recommend Christianity Rediscovered to you cross-cultural ministers because Donovan brings a fresh perspective. He was a Catholic, so his thinking breaks the mold of a lot of what those in evangelical circles are used to being exposed to. He was also a practicioner. He wrote as one who got his hands dirty working and sometimes failing, learning his lessons week-by-week as he brought the gospel to the Masai villages of East Africa. He was not a theoretician, isolated behind the walls of academia. Theologians can also benefit from reading Christianity Rediscovered, because our theology is richer when informed by cultures besides our own. If you’re interested in picking up a copy of the book, here it is on Amazon. If anyone does read it or has read it, I would love to hear what you think. This entry was posted in Cross-Cultural Ministry and tagged christianity rediscovered, masai, vincent donovan on October 22, 2008 by Chris.